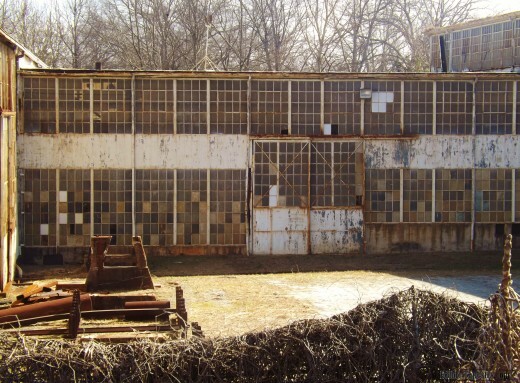 We set out on our little road trip earlier this year to find all of The Walking Dead film locations we could in a day and a half. I usually plan trips around food. Columbia restaurant in St. Augustine. Conch anything in The Keys. Buffalo burgers in South Dakota. Oddly enough, I didn’t take food into consideration when I planned our zombie mini vacation. I figured we’d just wing it as we went along. Well, the culinary adventure I found myself on with my family during that trip ended up feeling like a treasure hunt, pots of gold and all! 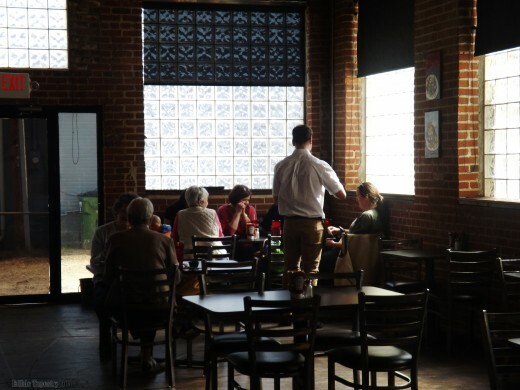 Maguire’s in Senoia was everything you could ask for in a stateside Irish pub. 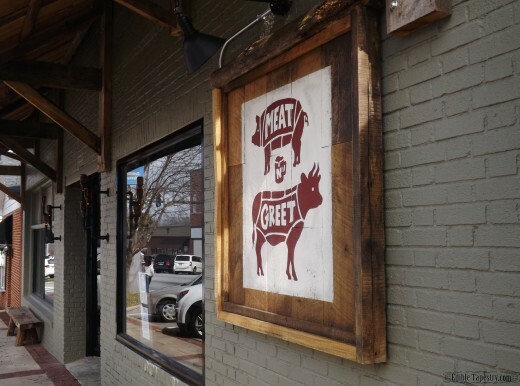 And the brand spanking new eatery we found in Newnan, Georgia, Meat ‘n’ Greet, was just as exciting. 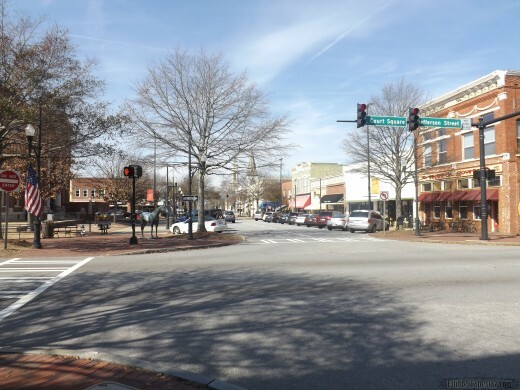 The little town we live in near Asheville, NC is teeny tiny with a “Main Street” and a clock tower, old buildings, and museums. 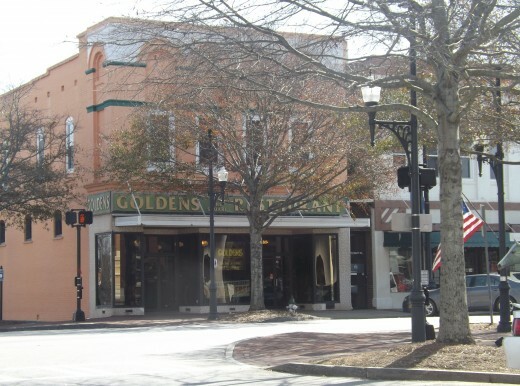 We know small town living, and love the Southern beauties that are built around a square. 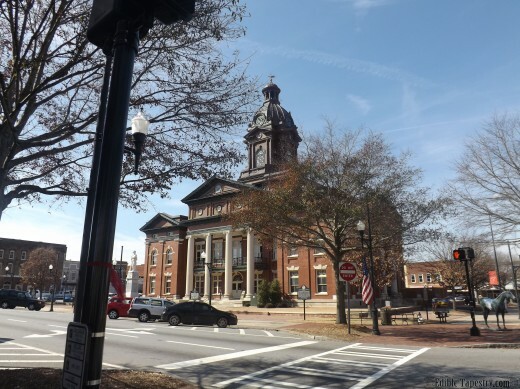 Still, we were not prepared for the old-time charm of Newnan the first time we drove through the center of town. After missing our turn, we finally found the “walker arena” we were looking for, then quickly headed back to the square to explore and search for lunch. 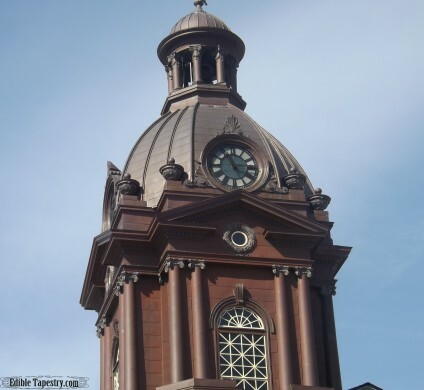 As I stared at the courthouse in the center of the square, I half expected to see Doc Brown hanging from the arms of the clock tower, or a DeLorean to zoom past struggling to reach 88mph. Great Scott! That’s a lot of copper! 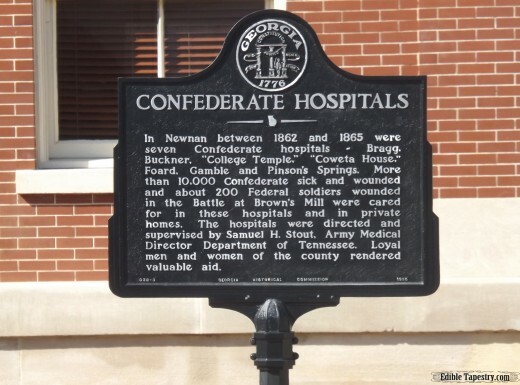 The courthouse sits on the site of the original that served as a hospital during the War Between the States. 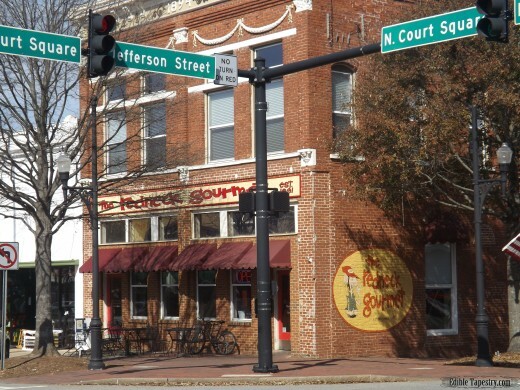 We found a few dining options as we strolled the charming streets. 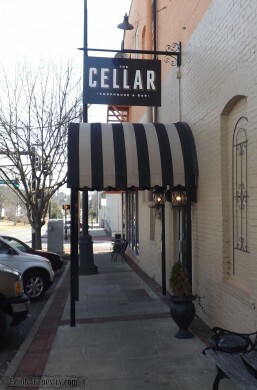 We particularly liked The Cellar because it reminded us of the decor in our master bath back home. Ha! No, really. But minus the awning, wine, and food. Add a toilet. There was even a little Thai restaurant at the end of one street. But what we were really looking for was a nice little diner. 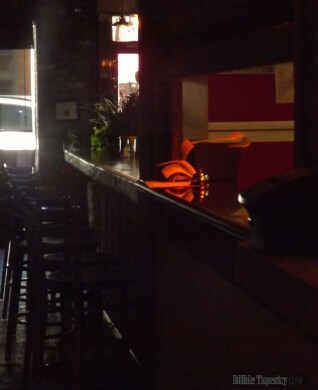 An original with checkered floors and rotating bar stools, and good ol’ burgers and fries. 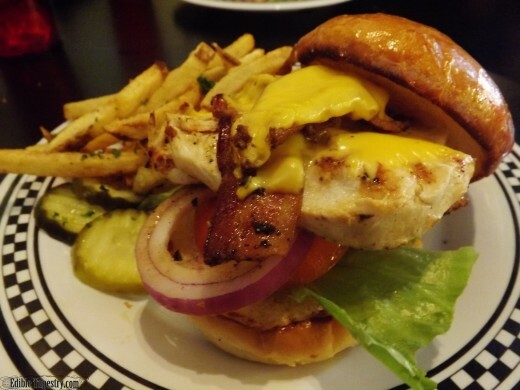 What we found when we crossed a street and saw Meat ‘n’ Greet was a fabulous new eatery with exciting versions of old time burgers, rich stone tile floors, and thick seasoned fries. 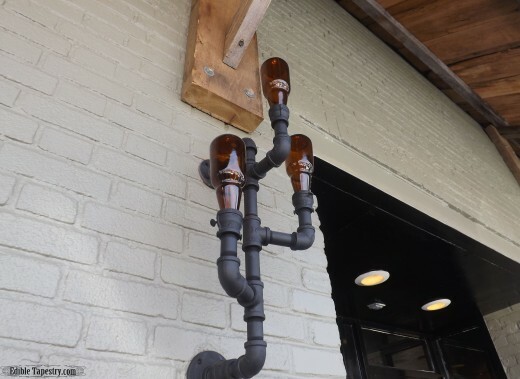 Having just attended the annual steampunk convention in Atlanta the day before, my husband, sons, and I appreciated the simple beauty of a pair of industrial sconces made from pipe works and amber beer bottles that flanked the entrance to the restaurant. Lighting made from pipe works and amber beer bottles. I must admit that when I stared up at them and then decided I needed to take a picture, I had one of those I’m going to do that! moments. Have at it, Pinterest-type people! You’re welcome. The creativity on the outside definitely made me want to see what I’d find on the inside. I wasn’t disappointed. An open kitchen! So exciting for guests, but I felt for those folks. 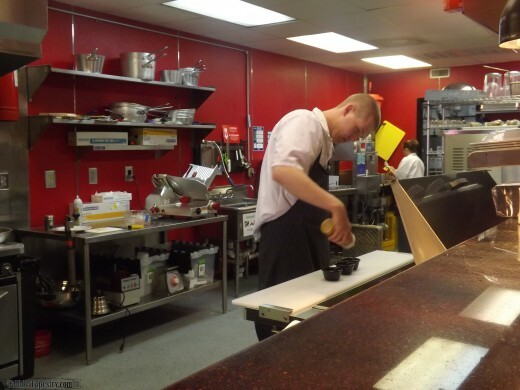 The first restaurant I cooked in also had an open kitchen. And it was sunken. So when diners chose to sit at the bar they looked right down at my station and hovered, literally, over my head as I prepared their meals. Agony for the shy girl that was, and very often still is, me. 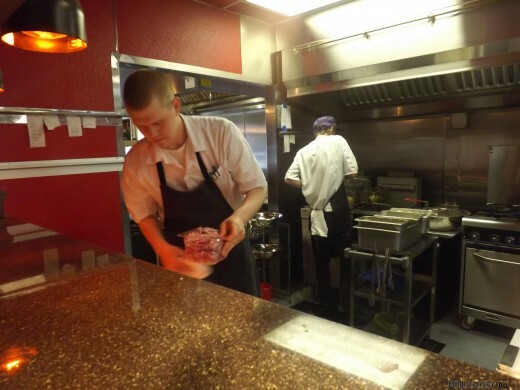 These efficient kitchen staff members didn’t seem to mind, however, even when I kept zooming in to get a few shots of them hard at work. 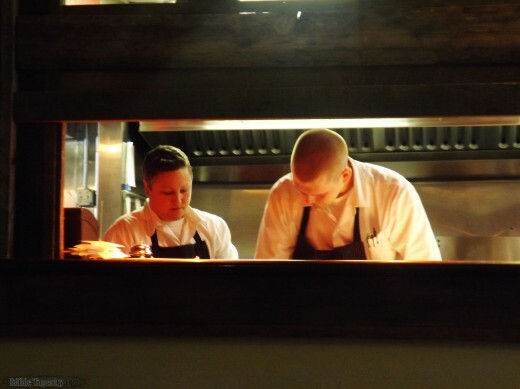 I found out later, when she so kindly came to check on our table and ask how everything was, that the patient instructor behind the heat lamps was Chef Amy Murphy, partner in ownership of Meat ‘n’ Greet. 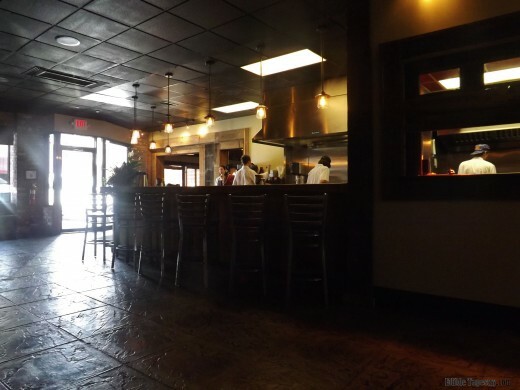 Chef Amy also owns Fabiano’s Pizza and the adjacent Alamo Theater, which has been converted into an entertainment and social complex. You can read more of her success story here in the article, Amy Murphy Sets Her Eyes on the Future. Seeing the interior of the restaurant and the kitchen certainly made me antsy to get a good look at the menu. From the butcher shop graphics of Meat ‘n’ Greet’s logo, we expected to find steaks and chops featured among the available dishes. We were a little surprised to find them missing. 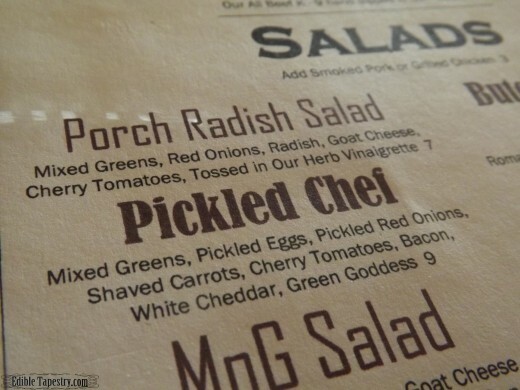 But when we were told that the menu was on a trial run because the restaurant had just opened, we completely understood the reasoning behind such a sensible, simple menu. Mouth-watering appetizer descriptions, a few salads, more burger variations than one would expect, creative sandwich choices, and just a few tempting dessert items rounded out the list. So many interesting ingredient combinations that I simply couldn’t decide what to order. 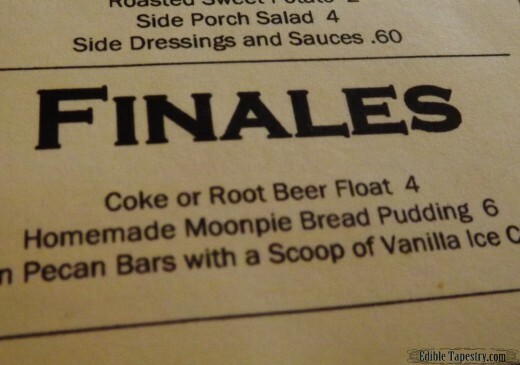 Yes, that says Moonpie Bread Pudding. As in the frosting covered graham cracker thingies with the marshmallow fluff inside…baked into a pudding. Because I just couldn’t decide on one thing and wanted to taste everything, we did something we don’t usually do. We ordered an appetizer. Well, two, to be exact. That’s how yummy they sounded! House made pimiento cheese was a given. Of course we had to try THAT. And it came with Fritos for scooping! I hadn’t had them since elementary school. 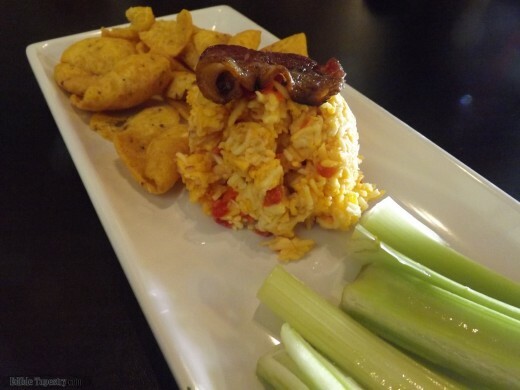 Or pimiento cheese, for that matter. Excellent! 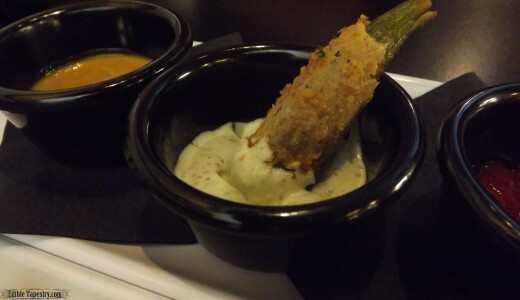 The hand cut fries, rings, and fried okra app. went on our friendly waiter, T.J.’s, captain’s pad. 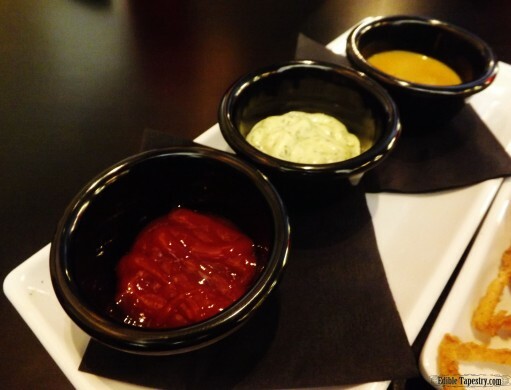 Such amazing flavors in the dipping sauces that accompanied our fried trio! Chimi Mayo, Carolina Mustard, and Chipotle Ketchup. 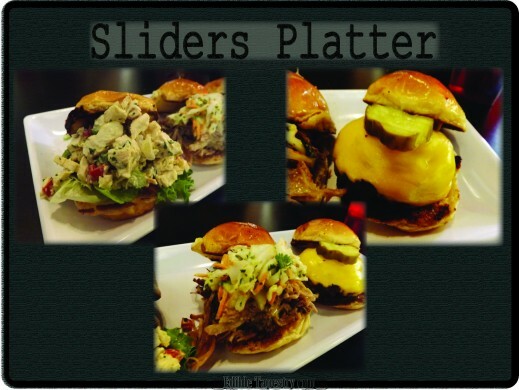 For my lunch, I decided on the sliders appetizer rather than one sandwich so I could sample three more of Meat N Greet’s interesting combos. Okay. Three apps. We ordered three that day, if you count my meal. Gulp. The smoked chicken salad could have been a little smokier and was a little on the dry side as far as chicken salads go, but the sweet little toasted yeast rolls that the sliders were served on were so good that I was sure they were made in the restaurant. They were not, we were told, but they did come from a local bakery. 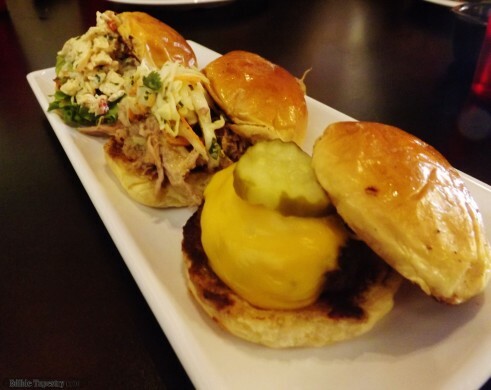 The pulled pork and cole slaw slider was fabulously smoky and sweet, and my mini beef patty was wonderful. One of my sons had the chicken club and the other had the mushroom burger. They both looked amazing and made my teens smile. 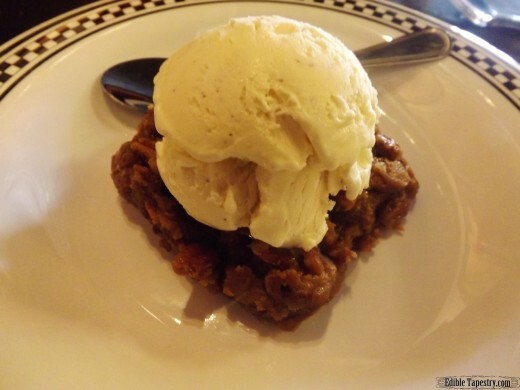 Moon Pie Bread Pudding and Bourbon Pecan Square with vanilla bean ice cream were our ending samples. The pecan square was like a subtle version of a Georgia pecan log. It absolutely melted in my mouth. 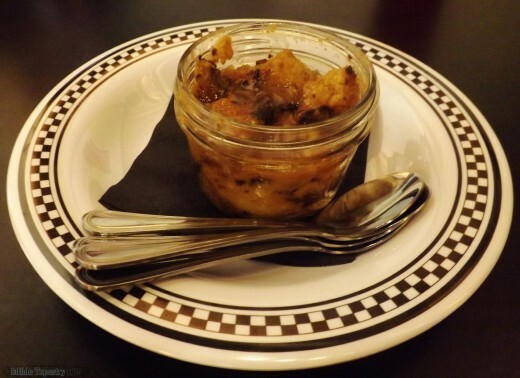 I’ve said it once, I’ve said it ten times at least since I started this blog, if you list bread pudding among my options, I’m gonna take it! 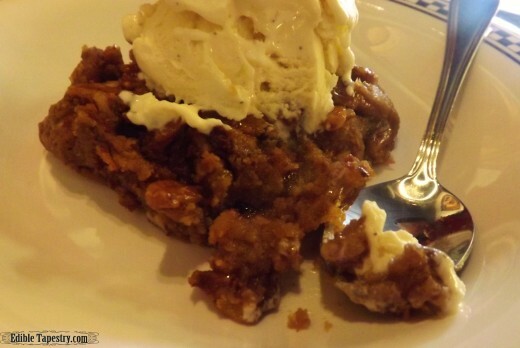 My three fellas shared this one, but I did get a taste just so I could say I’d eaten Moon Pie Bread Pudding. You know, it’s like fried Oreos. You have to do it once to say you did. We all loved that it came to the table in a little jelly jar. So sweet. Everything in the restaurant was immaculately clean. And I noticed as soon as I entered the spanking new, gorgeously designed bathroom that the owners use my public bathroom air freshener of choice…chlorine bleach. And lots of it. Does my germaphobe heart good! 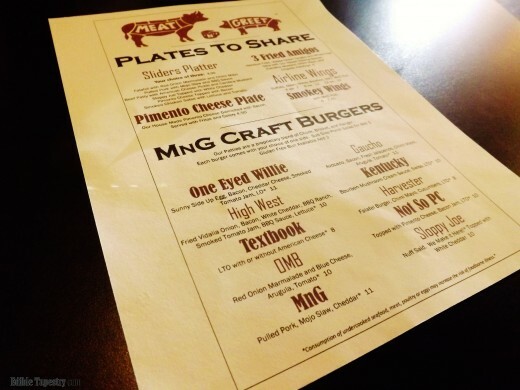 We will definitely be going back to Meat ‘n’ Greet for more taste testing, even though it’s over three hours from our home! 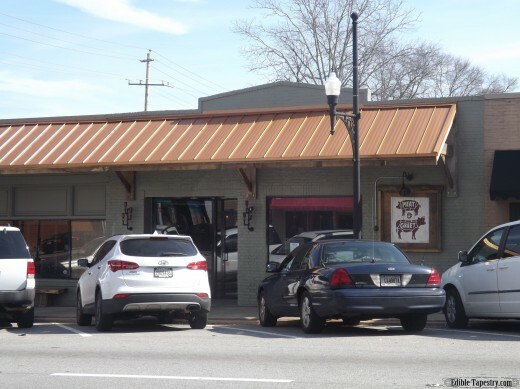 Meat ‘n’ Greet is open 7 days a week, 11 a.m. to 11 p.m.
It’s located in Newnan, Georgia at 11 Jefferson St.
That is so funny. I think I would too! It is a great little town. I can’t wait to go back for more exploring and good, GOOD food. 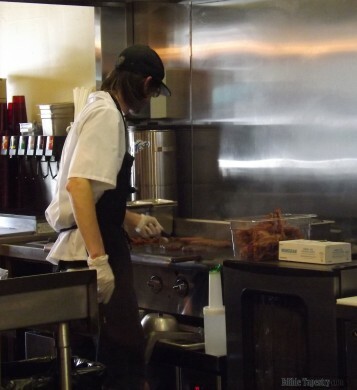 Ha I thought the same thing about the open kitchen when I went there the other day! I guess us shy people think alike!